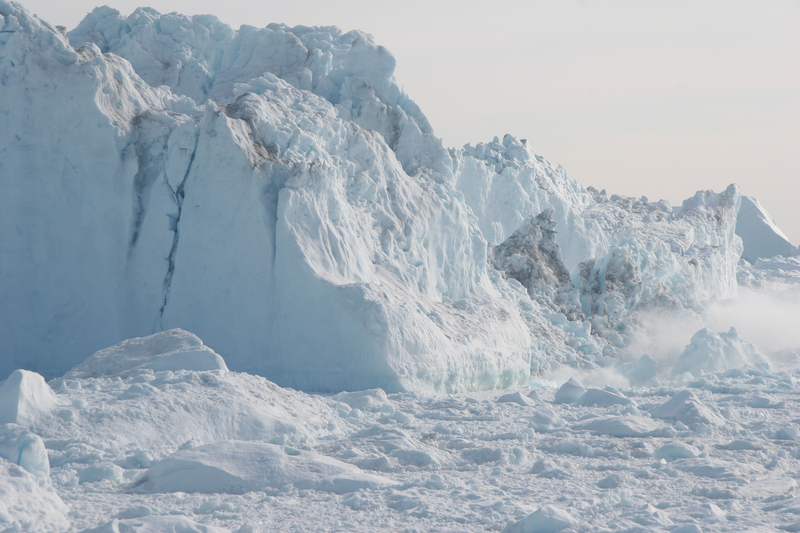 Through a stuttering veil of snow he sees at the floe edge a bluish iceberg, immense, chimneyed, wind-gouged, sliding eastwards like an albinistic butte unmoored from the desert floor. The berg moves at a brisk walking pace, and as it moves its nearest edge grinds against the floe and spits up house size rafts of ice like swarf from the jaws of a lathe. Sumner feel, as he watches, that he is seeing something he shouldn’t rightly see, that he is being made an unwilling party to a horrifying but elemental truth telling. As quickly as the chaos began, however, it ceases. The berg loses contact with the edge of the ice, and the shuddering cacophony of impact gives way to the remnant howling of the wind. This entry was posted in writing and tagged Ian McGuire, Ice Friday, The North Water by McPhedran. Bookmark the permalink.